There are 20 strips total--enough for a beautiful tassel--see last picture (not included). 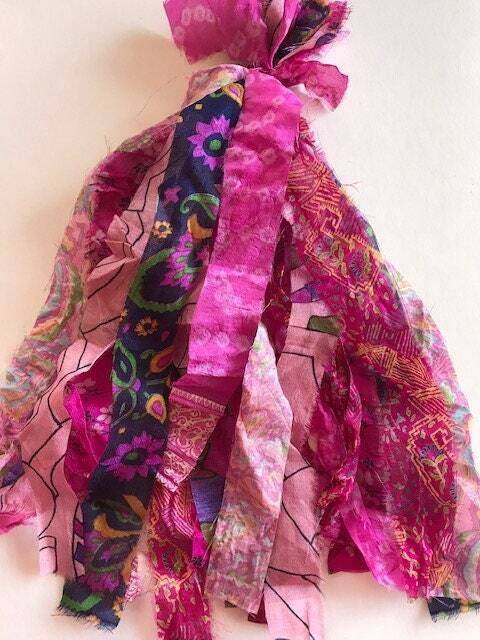 Or use them mixed with your solid colors to add interest and color to your tassel making. 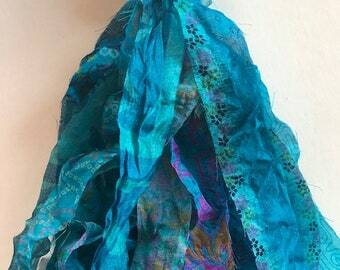 Also useful for all the wonderful projects you use regular sari silk ribbon for. If you wish to change the body of this silk, simply dampen it and either smooth it out or scrunch it, then let it dry. 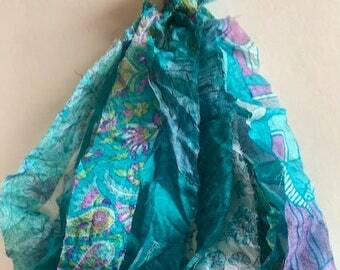 Recycled sari silk ribbon is so luscious with color. Sari's are torn into strips and knotted or stitched end to end. The ribbon has raw edges and the threads that linger come away very easily to make a smooth looking ribbon. Sari silk ribbon has so many uses: knitting, crocheting, quilting, weaving, jewelry, bangle bracelets, doll hair, flowers, paper crafting, wreaths, bows, garland, cording, art yarn, gift wrapping, scrap booking, tapestry, tassels, embellishment, fabric beads.